Professional. Comfortable. State-of-the-art. Client-focused. Fun. This is our conference room. It has a table, indirect lighting, some comfortable Steelcase Leap chairs, a museum of unusual and vintage cameras, HD projection to a 90” screen and big windows that look out to the parking lot. We also have skinny shelves to display storyboards. It’s a conference room. Our lobby doesn’t have a reception desk (we’re well hidden – we don’t get any street traffic), but it does have comfortable seating for five – or more if we drag in some extra chairs. It’s a great place for an informal pow-wow. You know, when the conference room seems too… conferency. Where else can you find Pro Tools HD, an isolated listening environment, world-class audio engineering talent and comfy leather sofas at basement studio rates? Whether you’re creating radio spots, tracking an original score, recording Foleys or mixing to picture, there’s nowhere better than WaveGuide Studios. Our recording room is far larger than a typical narration booth, and far more comfortable. Custom built as a room-within-a-room-within-a-room, it’s dead quiet, and big enough for a string quartet or a very large drum kit. It’s tunable - the Sonex® panels on the wall are removable so we can get just the right brightness, and we also have Sonex partitions that can separate performers so they can work together but be recorded cleanly on separate tracks. The booth is also fitted with custom-built silent ventilation, so the air conditioning or heating can keep the room at just the right temperature, even while recording. We weren’t kidding about “comfortable”. Check it out! In addition to designing on our computers (which we mostly do), we have an actual drafting table for sketching and design work! Purchased from Nimslo back in the ‘80s when they were moving from drafting to CAD, this Hamilton Dial-a-Torque table with a genuine Mutoh drafting arm is the state-of-the-art circa 30 years ago. But it still works beautifully, and we use it from time to time. But mostly the computers. Our walls are festooned with awards won by WaveGuide Studios and our team, along with some really cool movie posters (check out our first edition “Barry Lyndon”, for instance). There’s a wide range of awards – some of Steve’s Grammys from his years with the ASOC, and also his “Employee of the Month” at Wolf Camera back in the ‘80s. You get ten points if you find Marshall’s Valedictorian trophy from Columbine High School. 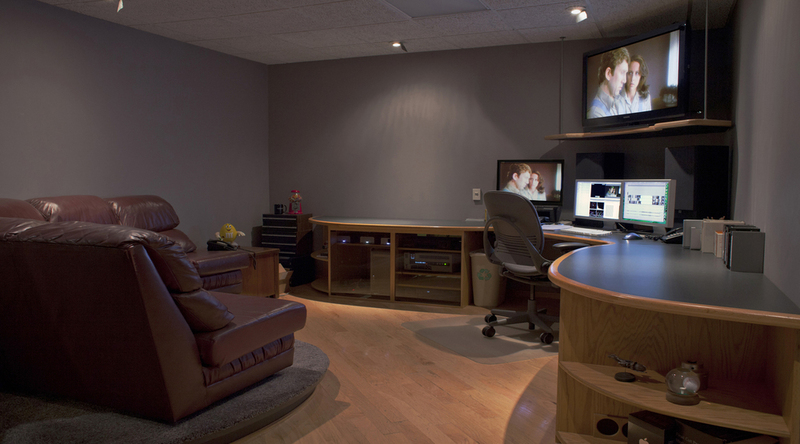 Our 4K/UHD edit suite, by itself, will make you happy you chose WaveGuide Studios. We’ve actually had clients offer to rent it as living space. But if we did that, you couldn’t come and enjoy our first-rate editing talent and tools. What’s great about our insert stage? It’s got a 16-foot cyc wall, a rounded corner for even larger sets, 22’ ceilings and an adjustable chain lighting grid. What’s less great? There’s no air conditioning back there, so it’s miserably hot in the summer. But we’ve still managed to produce some pretty cool stuff back here, including several items in the “work” section of this gigantic web site. The set/model/miniatures shop has many of the same features as the insert stage (especially the “no air conditioning” part - though since it’s back by the dock doors we can open it up and blow some air around). We’ve built a number of sets back here – an attic for Radiaflect, a sunroom, patio and garden for Owens Corning, a 300% scale gutter and house corner for Dixie GutterGuard… and the construction work to build the sound studio and the video edit suite. Are we too obsessive about doing so much in-house? Maybe. Does that obsession benefit our clients? Absolutely.